The app itself is free, but here is the the major caveat. (Isn’t their always a catch?) You must be a subscriber Big Ten Network through one of the participating TV providers. At the moment, the only participating TV providers are Charter, Bright House, Time Warner, Dish, and DirecTV. 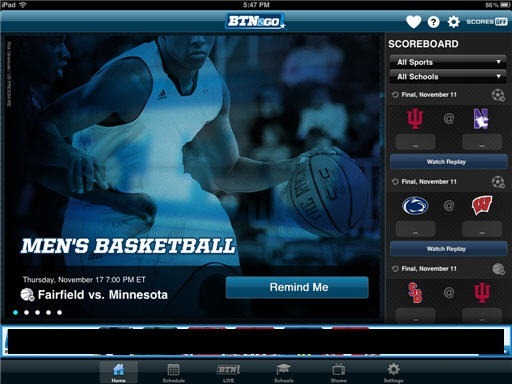 After downloading the app, you’ll need to enter your credentials to get access to watch the Big Ten Network. Access includes watching the network live including live games and on-demand access to video archives. Subscribers can also choose a favorite team and set game and score alerts. Unfortunately, If you aren’t a subscriber though one of the participating providers, this app will be essentially worthless to you. iPhone: BTN2Go for iPhone from the App Store. iPad: Download BTN2Go for the iPad from the App Store.